From September 11 to the Arab Spring. But what strikes me now, in glancing back at my little article, are a couple of non-reportorial ruminations that appear in the final paragraphs. These are comments on the philosopher Plotinus and his theory of evil, and on the poet Baudelaire and his theory of landscape. A lot of readers’ eyebrows must have arched. But I was trying to take in the event, and the ruminations pushed me to work up some thoughts. I went on scribbling notes, and a couple of weeks later I published the results in The American Prospect under the title “Terror and Liberalism,” illustrated with marvelous photographs of Italian fascists from Mussolini’s time, dressed in ridiculous uniforms, and other parading fantasists. Eventually I brought out a book under the same title, unfortunately without illustrations—my contribution, for better or for worse, to the literature of 9/11. I am a little ashamed to admit that, ten years later, my thinking has advanced only in matters of detail beyond what I thought in those first hours. I am ashamed because, among any of us who consider ourselves journalists, it is a point of honor to update hourly and to self-correct twice a month. Only fanatics and street signs point forever in the same direction, and I have never wanted to be a fanatic or a street sign. But then, I did not picture my ideas as a policy manual. Nor was I in the business of promoting the Bush administration. On the contrary! In that earliest of pieces in The American Prospect, I was already worrying out loud about the administration’s spirit of “cowboy ruthlessness” and the danger of loosening the legal restraints on the CIA. But mostly I wanted to leave aside the politics and the particulars. I wanted to construct a kind of lookout perch and go stand on it, as I had stood on my roof, and survey the scene. And so I put together a few ideas from books I had been reading and from essays I had already written, and, by climbing upward from one idea to another, I found myself contemplating a landscape made of liberal societies and of the animosities that liberal societies sometimes arouse. By liberal societies, I meant societies of the kind that encourage people to think rationally and creatively for themselves, and try to protect everyone’s right to do so, instead of demanding, as non-liberal societies do, that everyone adhere to the venerable and bow to the hierarchical. Liberal societies have been growing for the last couple of centuries, and liberal principles have been spreading around the world, and this has been, on balance, more than wonderful. But liberalism’s progress has also turned out to be, for a great many people, humiliating and terrifying, not to mention disastrous, on occasion. The liberal enterprise has kept on swelling, even so—and among the people who have felt outraged or frightened, the dynamism and the evident attractiveness of liberal principles around the world have sometimes generated panic, too, along with a suspicion that gigantic and sinister conspiracies must be at work. And the frightened people have rebelled. Sometimes they rebelled in the hope of preserving the past, a theme for peasants and artisans; and sometimes in the hope of merely expressing themselves, a theme for poets. But in Europe in the years after World War I, the rebellions also broke out in the form of well-organized mass political movements with revolutionary aspirations. These were movements of the extreme right, or the extreme left, or right and left at once. But mostly these were movements of the avant-garde. The founders were typically charismatic intellectuals who knew how to paint their doctrines in the colors of the future, which was thrilling. And the leaders recounted grand mythologies of world history. The surface details in those mythologies varied from movement to movement. Islamism seemed to me one more outbreak of this all-too-modern revolutionary phenomenon, and, for that matter, Baathism seemed to me another—two political movements that arose as part of the worldwide anti-colonial campaign, but also arose consciously in parallel with the fascists and the communists of Europe. The Islamist and Baathist obsessions about imperialist and Zionist plots, the calls for a utopian resurrection of the ancient Caliphate of yore (which meant theocracy for the Islamists and one-party rule for the Baath), the massacres that followed the Islamist and Baath movements like a shadow—all this seemed, from my lookout perch, entirely recognizable. Here were the worst parts of twentieth-century Europe, creatively adapted to the traditions and circumstances of the Middle East. Al Qaeda itself seemed to me entirely recognizable. It was one of several splintery offshoots from the main trunk of the Islamist movement, which was the Muslim Brotherhood, and the kinship of offshoot and trunk reminded me of the worldwide communist movement of forty years ago. Communism’s grand trunk was always the Soviet Union and the Moscowline communist parties around the world, who tended to profess a conservative and cautious instinct and who sometimes denounced and disdained their own splintery offshoots, the violent Marxist guerrilla sects. But in the communist movement, the trunk and its offshoots also dreamed of reuniting, and sometimes they quietly collaborated, and the Kremlin ultimately provided the intellectual context and even the material means for the offshoots to blossom. Here was the Islamist pattern. Al Qaeda’s exuberant internationalism was hard to miss. Bin Laden was Che Guevara, the multi-continental death-seeker. And, like the Marxist guerrillas, Al Qaeda enjoyed a genuine popular support in some places, as everyone could see by 9/12 or thereabouts. I ACQUIRED PILES OF Islamist tracts and tomes in English translation, and the tracts and tomes seemed to me oddly fascinating and rich, and this was especially worrisome. I knew something about the student ultra-left of a few decades ago in different parts of the world, and I knew in perfect detail how a slightly older student might gather together his younger friends and bedazzle them with concepts drawn from State and Revolution or from the Latin American pamphlets of various students of Louis Althusser, not to mention the grandeurs of Capital and the other masterworks. And this same seductive potential leapt up at me from the Koranic commentaries of the Islamist master-thinkers, Sayyid Qutb and Abul Ala Mawdudi. It was customary for a while to look on primitive madrassas in remote towns of the peasant universe as the root of the terrorist problem—religious academies where penniless boys with zero prospects for a better life are inducted into a culture of medieval rote-learning. But in regard to Islamism and especially its terrorist branches, the root of the problem seemed to me far more likely to be found on the other end of the educational spectrum: in the medical schools of Egypt or at Punjab University, or in places that might be regarded as still more prestigious—in the professional schools of Hamburg or the London School of Economics, where, after class, the students might amble off to their tea shops or apartments and pore over the same literature that was piling up on my floor. The Islamist literature convinced me that no amount of military action or Special Ops derring-do was going to prevent the jihadi vanguards from recruiting their cadres, to use the old Marxist term, from the fanciest of schools, and this was not a small thing. The whole history of the Marxist guerrilla movement had demonstrated that, if you can assemble even a modest cadre from among the well-educated, and you can motivate the members to forsake their privileges and comforts and trek into the badlands or the mountains, the cadre will always be able to recruit the wretched of the earth into the battalions of your insurgent army. And you can send those recruits to their deaths, regardless of the name of your cause or the preposterousness of its ideology or its prospects of success. Here, by the way, is a point that COIN, General Petraeus’s counter-insurgency theory, does not take properly into account—the reality that, unlike in the old-fashioned anti-colonial peasant insurgencies that used to trouble the British Empire, the center of a modern totalitarian insurgency is likely to be found in a faraway university, and not in the zones where the fighting takes place. Then again, you can out-argue some of those well-educated potential future leaders in their student lairs, if only you take the doctrines seriously enough to study them in earnest. Here was the good news. Even those of us without any sort of Muslim background can throw ourselves into the debate. The notion that Islamism comes from a different planet and is therefore impervious to understanding or criticism or refutation by infidels from the West seemed to me an Islamist notion, or maybe a Huntingtonian notion. But it was not, in any case, an accurate notion. Back in 1949, Arthur M. Schlesinger Jr. pointed out in The Vital Center that totalitarians were already engaged, if only in the recesses of their own imaginations, in a heated argument with liberalism and its principles. The totalitarians lived in fear that liberalism was right, and they fretted over the deviant impulses of their own wanton imaginations, and they insisted on peering into everyone else’s secret thoughts precisely because they knew that liberal heresies were alluring. Schlesinger made this observation with the European totalitarians in mind, but the observation seemed to me equally insightful about the Islamists in their European and non-European homes. Women’s rights, for instance: the Islamist writers, some of them, seemed to be exceptionally fidgety on this issue, as if they were feeling not too secure. But then, if the Islamist ideologues were, in their fashion, already arguing with liberals, surely liberals could argue back. On these grounds I figured that it was possible to imagine what Islamism’s demise might look like, someday in the future. It was not going to look like a return to the yesteryears of Ottoman antiquity or some other era of the Islamic or Middle Eastern past. Islamism’s demise was going to look like a flowering of liberal ideas, in some version or another. I pictured a liberal revolution, or a liberal-leaning revolution, or at least a few liberal implications turning up in metropolitan centers of the Islamist movement, or wherever the Baath or pan-Arabist dictatorships were thriving—a partial revolution, feeble maybe, but identifiably modern and liberal. Back in the 1990s, certain Iraqi émigrés were already predicting a regional uprising along those lines, though naturally their own concern was principally with Saddam Hussein. But the émigré ideas were in sync with worldwide events, and I did not see why the Arab zones and the “stans” and Iran (where an anti-Islamist student movement was already visible) should remain forever immune to impulses cropping up everywhere else on the planet. Or I looked for something not-so-revolutionary—an Islamist evolution resembling the slow development of the Italian Communist Party, which was at one time the largest communist party outside of the communist bloc, with excellent prospects for inheriting Italy someday. The Italian Communist Party nonetheless chose, after a while, to renounce its own historic doctrine, and to criticize it, and to abandon its own name, and to embrace instead a spirit of liberal reform. And along with the official communists came, with a lag, Italy’s ultra-left splinter groups as well, with their desperado mentality—the violent guerrillas who looked up one day and discovered that, while they still had pistols, they no longer had a doctrine. This sort of development does take place, now and then. I MAKE NO CLAIM for the originality of my analysis—only for its 9/11ness. I drew my ideas from the anti-totalitarian writers of the 1940s, and from some of the French writers of the 1968 generation, and from various liberals from Muslim backgrounds, which is to say, from books that a lot of people were reading. And, as the post-9/11 disputations wore on, I noticed that, in a variety of countries, any number of writers and political people were arriving at views roughly similar to my own. Something less than a school of thought arose—less than a school because not everyone agreed on vocabulary (“totalitarianism” is a vexed term), and not everyone agreed on some large policy questions (e.g., the wisdom of invading Iraq). Still, the ideas did become visible. They aroused criticisms. And since the ideas have not gone away, and neither have the criticisms, I think it might be useful to mention the four main criticisms, or what seem to me the main ones, and to offer a few comments. According to the first criticism, analyses like mine vastly underestimated the danger posed by groups such as Al Qaeda. The enemy, according to the critics, was not a splinter group, nor a mass movement called Islamism. The problem was infinitely huger, and this was Islam itself, the ancient religion. According to this criticism, the Islamists, mainstream and ultras alike, were merely pious Muslims who had properly understood their own religion and were putting it into practice, and Islam was a dreadful thing, and ideas like mine amounted to a politically correct effort to deny reality. This argument struck me as slightly medieval, or anyway as simple-minded. I could understand why someone who had grown up in an Islamist atmosphere might decide to condemn the whole religion. (I can understand, for that matter, why anybody at all might condemn his own religion, or might turn against religion altogether: atheism is not among the world’s mysteries.) Still, the history of Islam was not a tale of unrelenting dreadfulness. Islam over the centuries had gone through every possible phase and its opposite, the magnificent and the miserable, and it had generated thinkers and counter-thinkers of every sort, which meant that, like the members of any large confession, Muslims were forever doomed to disputation with one another over whose interpretation was properly authentic. Anyway, Islamism seemed to me more of a political movement than a religious upsurge—a “religionized politics,” in Bassam Tibi’s phrase. According to the second criticism, the error in views like mine was entirely the opposite. Instead of failing to attack Islam, ideas like mine had indeed attacked Islam, and the attack was bigoted and despicable. This was, of course, the Islamist accusation. The whole point of Islamist doctrine is to insist that imperialists and Zionists are plotting to destroy Islam, and they alone, the Islamists, are mounting a defense. From this standpoint, anyone who criticizes the Islamist movement must be Islam’s enemy—in my case, because I was following in the footsteps of my predecessors, the Jews who conspired against Muhammad in ancient Medina (or so I gather, judging from a passage in the preface to a 2004 edition of Qutb’s commentaries). This was the “Islamophobia” accusation. The followers of Qutb were hardly the only ones to make it, though non-Islamist critics generally left out the part about the seventh century. The accusation, in either version, was untrue. The accusation opened a door, however, to a less exotic contention—the claim that, instead of vastly underestimating the danger, people with views like mine had vastly overestimated it. Our mistake, from this perspective, was to regard Al Qaeda as anything more than a pirate band. We were wrong to suppose that any large body of opinion stood behind Al Qaeda, or to look for a relation between offshoot and trunk. Nor did such a thing as an Islamist movement exist—only a great many pious Muslims around the world. Or, if the Islamist movement did exist, there was no reason, apart from bigotry, to look on the movement’s mainstream with any anxiety. Or, if Islamist groups here and there did in fact pose a violent danger, it was only because their enemies had inflicted injuries, and wounded people instinctively resist in whatever ways are at hand. The problem, viewed from this standpoint, was American policy. Israel was the problem. And views like mine exacerbated the problem. But this criticism, too, left me unconvinced. An Islamist movement did exist. The word “Islamism” is itself an Arabic term, Islamiyya, useful for drawing a distinction from Islam. The movement’s resemblances to other totalitarian tendencies were, at least in my eyes, too striking not to notice. Nor could I accept the notion about wounded people and their instincts. Immersion in the Islamist tracts had led me to respect the Islamists, in a fashion. The Islamists had their own ideas. The Islamist movement was not a giant knee that jerks when pounded by a rubber hammer. And I took it as a given that neither the United States nor Israel was conspiring against Islam—though it is true that, years ago, Slobodan Milosevic used to regard himself as the leader of a medieval Christian crusade, and the Norwegian terrorist just now is dreaming of the Knights Templar. It was the third criticism that grabbed my attention. It taxed people like me with a sort of philosophical error. Our mistake was to have bothered making any sort of elaborate ideological analysis at all. This was especially my own mistake, given the efforts I had made to work up detailed interpretations of Islamist texts. By reading too many tracts and by ruminating over too many grandiose theories, I had taken my eye off the main thing. The main thing is economics, power relations, and the kinds of anthropological structures that, since they are unlikely to bend or sag or collapse for many centuries to come, should be regarded as hard realities. The main thing consists, in short, of material facts. By focusing on Islamist ideas, and by emphasizing the importance of intellectual argument, instead of dwelling on the material factors, I had promoted the delusionary idea that abstract thinking rules the world. That was a popular criticism. To my mind the criticism contained a philosophical error of its own. This was materialism, the crudest of doctrines: the belief that human nature can be reduced to a single element, which is material force or interest. Whole schools of thought stand on the materialist assumption, and anyone can see why. A glance at today’s news or at random periods of the past ought to show that economic and other concrete factors normally do play a decisive role in driving world events. Still, if you allow your glance to linger awhile, you might notice that other factors sometimes figure in as well. Now and then, people act on their beliefs. Sometimes beliefs change. The rise of Christianity—to cite a non-trivial example—does not lend itself to any obvious material explanations. The religion got started in a backwater province among people with very little power or wealth, and yet within a mere three hundred years, a blink of an eye in those times, it managed, by force of persuasion, to conquer the Roman Empire and change world history irreversibly. A study of Roman economics and Mediterranean trade routes might reveal a few circumstances that favored this development, but I do not think that even the most rigorous such study would solve the riddle of what occurred. The rise of Islam offers an equally puzzling instance. The fact that desert tribes could emerge out of nowhere and conquer most of a sophisticated Mediterranean world and beyond could be attributed, maybe, to freak military circumstances. But how to account for the conquerors’ success in converting, and not just temporarily, huge portions of the newly subject populations, and for their success at founding a new civilization? I think that, in the cases of Christianity and Islam alike, you have to recognize the independent force of the founding figure and his personality and doctrine—which is to say, the power of an idea. THE TOTALITARIAN rebellions of the twentieth century offer variations of the same strange phenomenon, except that, unlike Christianity and Islam, the totalitarian movements have subtracted from world civilization instead of adding to it. We are told of economic progress under the czars that enraged the new industrial proletariat by raising everyone’s expectations without delivering results, which led to the Bolshevik Revolution; and of an economic collapse in Weimar Germany that, having driven people to desperation, led to the Nazi takeover. But if revolutions can emerge from either economic growth or economic collapse, maybe it would be wise to look for other factors as well. In each of these instances, Bolshevik or Nazi, a key element would appear to be the charismatic leader and his ideas and personality. “Look at his hands,” as Heidegger said. But communism offers the strangest of all examples, if only because communism’s doctrine consists precisely of insisting that material factors rule the world, and communism’s success refutes that very doctrine. The speed of its success outdid even Islam’s. Marx wrote his books and, thirty-four years after his death, Lenin and a few followers staged a Marxist uprising on the periphery of Europe. Within another thirty years or so, communists ruled half the earth: the most extraordinary rise to power in world history. No material factor can satisfactorily explain such an event—as Sidney Hook, whose ideas I am borrowing (and mangling), pointed out long ago. Remove Lenin, and the Soviet Union would never have emerged. It did emerge. And then, by force of ideas and personality, Lenin and his tiny circle of comrades succeeded in convincing a significant portion of the intellectual class and a portion of the labor movement on every continent that communism embodied the highest state of human knowledge and the noblest ideals of civilization; and the intellectuals and labor leaders recruited followers among the oppressed, who can always be found. Still more striking is communism’s demise, which occurred in the manner of a chess game played by two grand masters who shuffle their pieces around the board until one of them inexplicably announces, “White resigns.” Yes, the Eastern Bloc had entered into long-term economic doldrums, but this could have gone on for centuries, even if Ronald Reagan had tripled the defense budget. Besides, economic difficulties in the Eastern Bloc put no pressure at all on the communists of Italy, whose own country was thriving. Why, then, did all these people on either side of the Iron Curtain throw up their hands and announce that communism was henceforth defunct? Again you have to factor in the power of ideas. LENIN AND HIS COMRADES at the start of the movement, with their claim to have discovered the science of human progress, draped themselves with intellectual prestige. But other people went poking at the claim. Sometimes those other people brought to their criticisms an intimate knowledge of Marxism and of Leninist doctrine, which allowed them to address communism’s subtle inner points—to demonstrate that communism was mistaken not just in practice, which could be remedied, but in theory, which was devastating. I have mentioned Sidney Hook, who, back in the 1930s and 1940s, was a prime American example of someone offering this kind of criticism. By the 1970s, sophisticated criticisms of communism had succeeded in decimating the movement in France. This was a big development, given that, for many decades, France had been the worldwide center of communism’s intellectual glamour. In the Soviet Union itself, the grand representatives of Russian literature demonstrated that, if any further Russian masterworks were going to be written, they were going to be anti-communist exposés—another dismaying blow. The embrace of the dissident argument by a single nuclear physicist, Andrei Sakharov, devastated the morale of the Soviet Communist Party itself. (Memo to the shadowy group of bicyclists who have lately been assassinating Iran’s nuclear scientists: have you considered the consequences of persuading one of those scientists to rethink his political ideas?) If the Eastern Bloc communists had worried about economic decline but wanted to stay in power even so, perhaps they could have revitalized their own economies by adopting, as their Chinese comrades did, the policies of Augusto Pinochet. But Pinochetism was not going to solve the problem of intellectual prestige. The Chinese communists did not care about that sort of prestige. The communists of the Eastern Bloc did care, and Italy’s communists cared intensely; and those people preferred to fold. But this merely suggests that Islamism offers one more instance of the independent power of ideas—in this case, as in the case of communism, a veritable cult of ideas. Those tracts and tomes and Koranic commentaries, the scholarly works of Khomeini and other people—those are not just tchotchkes of the cause, like the giant posters of bearded sages and the miniature models of the Al Aqsa mosque. The ideas in those writings, surrounded by their nimbus of prestige, comprise the movement’s central force. Islamism is not something like love for your own home, or the resentment of poor people for the rich, or the folklore of religious tradition, which would exist even if no great writer had produced a shelf of books on the topic. The movement has been purposefully constructed. But if any of this is true, and Islamism offers one more variation on a recognizably modern impulse, which is the avant-garde urge to rebel against liberal ideas and customs—if this is true even in a modest degree, then it makes sense to emphasize the importance of argument and criticism, including arguments and criticisms from outside the Muslim community. (If the classic Islamist texts can invoke a document like The Protocols of the Elders of Zion, with its French, Russian, and German provenance, surely anti-Islamists can invoke a few alternative ideas from the French, the Russians, and the Germans!) Still, no one can doubt that, in the matter of argument, the insiders of the Muslim world, and not the outsiders, will make the most persuasive points. The progressive thinkers from Muslim backgrounds, the people who have chosen to retain their religious identity and the people who have chosen to foreswear it, the people who have experienced for themselves the atmosphere of the Muslim Brotherhood and its fraternal organizations, the jihadis who have contemplated their course in life and have elected to become thoughtful and articulate exjihadis, the people who know what it is to be locked in an Egyptian jail, the people who find no difficulty in invoking in a single breath their own experiences and the principles of John Stuart Mill, the people who know how to distinguish a genuine feminism from the Islamist variety—these people, the Muslim liberals (or liberal ex-Muslims, as the case may be), will turn out to be the counterparts of the Soviet and Eastern Bloc dissidents. All the efforts of American commandos and drones notwithstanding, they are the ones who will bring the movement down. Then again, this argument, the one about Muslim liberals and the power of ideas, has provoked a fourth and ultimate criticism, which I think has been regarded as the most devastating retort of all. It is the criticism that flatly asks, what Muslim liberals? The question is sometimes phrased plaintively, and sometimes sneeringly, as if the mere asking demonstrated the absurdity of our argument. Some of us have spent ten years trying to respond by invoking the names of one person after another who comes from a suitable background and has contributed significantly to the liberal literature. And for ten years these responses have aroused the dismissive rejoinder that such-and-such a liberal from a Muslim background argues too fiercely or has fallen for Friedrich Hayek, and thereby has lost credibility; or that someone else’s ethnic authenticity is tarnished by too much enthusiasm for America or France or some other country; or that neo-cons or maybe the king of Morocco are paying the bills, and so the anti-Islamist liberals with Muslim or Arab credentials must surely be corrupt. This last point gets repeated ad nauseam. All of which has amounted to saying that authoritative and persuasive liberals from Muslim backgrounds do not exist, and anyone who does appear to exist is either inconsequential or a fake and may well be a bad person, and Muslim liberalism will never be a force. Such was the fourth criticism. But see what has happened. The crowds started to gather in town squares in North Africa and other places in the Arab world nine or ten months ago. The crowds articulated three grand principles, which everyone understood all over the world. The crowds stood in favor of democratic rule of law. The crowds stood in opposition to corruption. And the crowds proclaimed themselves to be citizens of states. Their symbol was the flag of Tunisia, or the flag of Egypt, and so forth. This was not like designating themselves as members of the Muslim ummah, or as representatives of the larger Arab nation. These people were not, in short, Islamists. They were not pan-Arabists. They were liberals. They were also, at least for the moment, popular. The Arab Spring had gone into bloom. And the fourth criticism collapsed—or, at least, ought to have collapsed. A COMPARISON of the Arab spring to the Eastern Bloc revolutions of 1989 does seem apt, if you bear in mind that Eastern Europe’s success stories are not its only stories. Once the communist system had lost its legitimacy, every country in the old Soviet bloc found itself caught in a three-way battle over the shape of the new society. The heroic anti-communist dissidents, basking in their glory, stood in one corner, upholding the principles of liberal democracy, although not always in a well-defined form. Ethnic haters stood in another corner, trying to incite pogroms and wars—the ethnic haters, whom the old communist regimes had always invoked as the justification for communist dictatorship. The communists themselves occupied still another corner, vacated of any doctrine but in no rush to vacate their offices, too. In each country, the three-cornered battle yielded its own result: a mostly brilliant liberal success in the Czech Republic, besprinkled for a little while with fairy tale elements; an unexpected alliance of liberals and reformed communists in Poland, who succeeded in tempering the ethnic haters, who maybe were not so dangerous to begin with; a catastrophic fusion of ethnic haters and old communists in Serbia, supported by Russia; a communist continuity in Russia itself, with the ideology shrunken to nostalgia and a cult of the state; and so forth. The successes have been marvelous. As for the failures, we have not yet even learned the basic facts, given that the grisliest failures of all took place not even in the Balkans but along Russia’s southern border, simmering even now, more than twenty years later, where very few reporters have ever been. The Arab anti-authoritarian revolts are likely to produce a range of experiences something like this, except without the fairy tale aspects. The three parties are going to be the Facebook liberals and their friends, basking in glory; the old mukhabarat or secret police and military regimes, in the role of the de-ideologized East Bloc communists; and the Islamists, mainstream and ultras, in the role of the ethnic haters (though collective hatreds take other forms, as well). Only the whole weight of forces in the region appears to tilt more ominously than it did in Eastern Europe. It is cheering to reflect that nowhere at all did Islamists lead the revolutions, which suggests that something in the Islamist movement may be out of step with the times. And it is doubly cheering to reflect that Islamism’s most extreme wing played no role at all. Nowhere at all did Al Qaeda or its allies look like a revolutionary vanguard. Even so, the Islamist advantages are painful to enumerate: the backing of Iran, huge organizations, mosques, a powerful and weathered sense of discipline linked to a long-haul strategy, experienced leaders, and financing that appears to be unlimited. Even apart from Iran, Islamists already control Gaza and portions of Lebanon and its government, and militias prowl Iraq, and the ultras have shown themselves capable of seizing parts of Yemen. 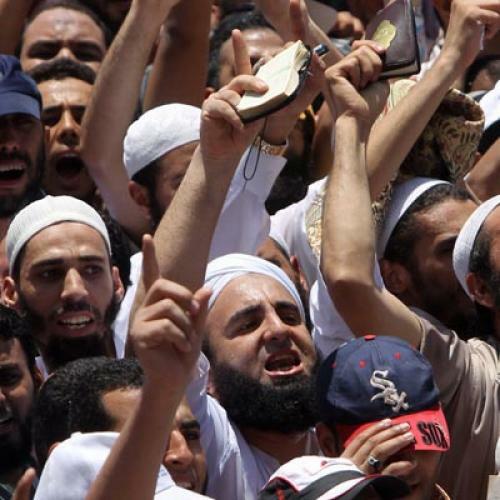 The factional divides among the Egyptian Islamists do not appear to be crippling, and may even prove to be useful. Who will stand in those people’s way? The Egyptian army, which must be dreaming of action, is also maneuvering to survive, and if the generals have not already cut a deal, surely they are working on one, which can only mean that, in the Arab world’s leading country, the army and the Brotherhood are arranging a do-over of their unfortunate falling-out in 1952, and this time the results will make room for both of them. And the Facebook liberals and their friends and their moment of glory? A point in their favor: it is wrong to suppose that political inexperience and naïveté are invariably fatal. The dissidents who led the revolutions of 1989 tended to be people with backgrounds in the arts or in lonely intellectual work, without organizational sophistication and typically without personal political ambitions, either—political naïfs, in a word. And having led the revolutions, most of those people disappeared from the scene within a few months or a year. Václav Havel was an exception. Still, the dissidents established a tone, and, in the more fortunate countries, the tone proved to be lasting. The dissidents would never have succeeded in igniting those revolutions at the start if large portions of society had failed to see in the dissident movement an attractive ideal. Anyway, the dissidents enjoyed a couple of advantages, and one of those advantages was at home. Behind the dissidents stood any number of non-naïfs who may have lacked the initiative or selflessness to lead a revolution but who did want to be politicians. These were the people who got rid of the dissidents in no time flat. A sufficient number of the politicians nonetheless agreed on the crucial point, which was that, in the former Eastern Bloc, society could aspire to something loftier than ethnic purges and organized crime; and the loftier alternative could be seen in Western Europe, their model and their ideal. And so the politicians, who disdained the dissidents, sometimes carried on their work. The dissidents’ second big advantage was abroad. A lot of people in the Eastern Bloc did look westward for inspiration; and the Western countries, not just the United States, tended to be enthusiastic, even if not in every instance. Whole institutions in the West, foreign services, secret agencies, radio stations and the press, and even financiers came to the aid of the liberals, naïfs and politicians alike. And the post-communist liberals could then present themselves to the general public in their own countries and persuasively boast: we are welcomed and admired by the world. Maybe in Tunisia the Facebook liberals will end up having pioneered a future of that sort—though I see that Abdelwahab Meddeb, the distinguished Tunisian-French liberal writer, has already worried in print about the consequences of allowing Tunisia’s Islamists to become a legal party. Even in the Arab Spring’s best candidate for brilliant success, some intelligent people are evidently feeling less than confident. Still, the Tunisians enjoy several advantages—a tradition of trade union independence, some good years at the start of the anti-colonial revolution, a prosperous diaspora in France, and so forth. But who will step up to support the Facebook liberals and their legacy in the other countries? Will it be the older, experienced politicians—the people who want to be politicians? Some of the older politicians who are called liberals in Egypt seem, upon closer examination, to be more upset about Zionism than those early crowds in Tahrir Square appeared to be, which may suggest that here is not a fresh new view. THERE IS ALSO the matter of support from abroad. It is wonderful to learn that, during these past many years, America’s Democratic and Republican foreign policy institutes have been quietly backing the Facebook liberals, and kept on doing so even when, in the later Bush era and early Obama years, the rhetoric from Washington turned against anything as noxious as “democracy promotion.” The National Endowment for Democracy has got to be one of the most productive agencies in the history of American foreign policy. And how exciting to read about the effectiveness of Gene Sharp and his NGO, the Albert Einstein Institution, which is truly non-governmental—Sharp, the theoretician of non-violent revolution, who started out as a secretary to the Reverend A.J. Muste, one of the grand heroes of the American left, the national leader of the antiVietnam war movement. Muste, the mentor to the mentor of Martin Luther King Jr.! Here is something unexpected: a previously unnoticed under-the-radar foreign policy coalition of the Democratic Party, the Republican Party, and a legacy from America’s Christian pacifist ultra-left, informally united to foment nonviolent liberal revolutions in faraway places. For all we know, the Obama administration may be engaged in still other useful activities. WikiLeaks is sincere in its devotion to the cause of anarchist subversion, but instead of undermining the superpower, the anarchist hacking has revealed that many an American diplomat is honest, principled, and perceptive. But those are activities in the zone of the invisible. In the visible zones, the Arab Spring has aroused in the Western countries almost none of the enthusiasm that greeted its Eastern Bloc antecedent. We will lift a pinky. In Syria, perhaps not even that much. Is it true that, militarily, we and our allies are stretched to the limit, or beyond, or worse? It must be true. The news from different fronts aches the heart. Still, the longer the tyrants of Libya and Syria go on murdering their own people, the more disastrous for everyone, and not just their own people. I know that President Obama has other problems. But why he is so reluctant to try to influence the international mood? Once upon a time, huge crowds of Germans assembled to hear him speak. Today even his oratory leads from behind. Perhaps the Obama administration’s hard-nosed experts on the Middle East are instructing the president that liberalism is a doomed cause—though hard-nose-ism, which is the main tradition in America’s Middle East diplomacy, does not have a long record of success. Or maybe another factor has come into play, which has to do with the larger intellectual environment in the United States and the other Western countries. In the intellectual world, the Islamists, like the pan-Arabists before them, have won an amazing number of debates. The universities and some of the magazines are, even now, filled with people who think that, if Arabs are oppressed, Zionism must be the principal culprit within the region, and Western Islamophobia must be the principal culprit abroad. The crowds chanting “The people want to topple the regime” in one country after another have altered these stubborn highbrow Western assumptions not at all. In a school where I teach a course, I discover in my mail slot a petition signed by university luminaries demanding action against Israel, but not a single manifesto or call for solidarity with the people of Libya, Syria, Bahrain, and other places. The Middle East studies departments remind me of Latin American studies departments that I used to know in the 1980s, which radiated an influence from the reigning Fidelista Marxism of the Latin American universities of the time—except that in the Middle East studies departments of our day, the tendency leans toward Islamist apologetics. Since I have already brought up the accusations of corruption that are routinely thrown at Muslim liberals in the West, perhaps I should mention that, in the intellectual world, accusations can also go the other way. Shortly after the leader of Tunisia was overthrown, and after the leader of Egypt was overthrown, the director of the London School of Economics was likewise overthrown, or at any rate took it upon himself to resign, not because he was revealed to be a tyrant but because he was revealed to have allowed the Qaddafi family to subsidize his university. The Qaddafis scored a similar success, indirectly, at Harvard. The Qaddafis contracted with a Harvard-connected p.r. agency to generate friendly publicity, and the agency arranged for junkets and interviews, and some of the results turned up in the finest of publications, not excluding The New Republic. Here is a “soft power” problem, if I may use the term. Of course the Qaddafis, in regard to Middle Eastern funding of Western universities, are small players. I do not even refer to the influence of “hard power” in its hardest of versions on Western discussion—the distortions introduced into Western discussion of Islamism and anti-Islamism by simple fear of terrorist attack. But then, having just made an argument for the autonomous power of ideas, I do not want to overemphasize the role of junkets, manipulation, money, and violence. BUT WAIT. The anniversary of September 11 reminds me that, before I come up with a gloomy word to conclude my sentence, it might be useful to recall the Middle Eastern landscape of ten years ago. It was not a spectacle of hope. The whole region seemed to be veering in terrorist directions, with battles almost everywhere going on between Islamists of different stripes and mukhabarat regimes, likewise of different stripes, ranging from the bad to the ghastly. And ten years later? Dismal still, in a kaleidoscopically different pattern. Anyone can think of doomsday possibilities—an Iranian order to Hamas and Hezbollah to launch a regional war, and so on. Still, two new elements, which you could not have found ten years ago, figure nowadays on the landscape. Here and there around the region you can see democratic institutions, shaky as a leaf—threatened by terrorists and Islamist militias in Iraq, trampled underfoot by an Islamist militia in Lebanon, still merely a project for the future in Tunisia, and feebler yet in Egypt, given that, if the Egyptian elections go ahead, they will probably bring the wrong people to power. Democratic institutions nonetheless amount to a new element. And something else: the ineradicable fact that liberals, relatively isolated and weak as they are, have made a mass appearance on the public stage, and the liberals left a good impression on the rest of society, and they even demonstrated the ability, for a moment, to shape events, and their day may not be over yet. Do these new elements add up to nothing? If you are philosophically a hard-core materialist and you tally up the measurable facts of power and wealth, they add up to nothing. But if you consider that ideas sometimes have an autonomous force of their own, and that liberal ideas are more likely to flourish in an atmosphere of freedom, these two new and feeble elements look like—well, a beginning. Paul Berman is a contributing editor for The New Republic. This article originally ran in September 15, 2011, issue of the magazine.